Oze-numa is located the west-end of Fukushima prefecture. Oze is one of the most popular nature spots around Tokyo. 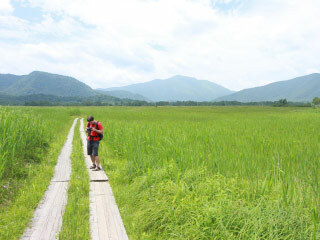 It is a marshland surrounded by high mountains. The marshland is also located in high up in the mountain. Because its rich nature, pure water and cool weather, many people enjoy hiking and trekking during the season. It has a beautiful ponds, rivers, waterfalls mountains and forest. Also, it offers beautiful seasonable flowers, specially Skunk Cabbage is so popular here. The entire site is registered as the national park and special natural monuments of Japan. Use Tohoku Express Way. Exit at Shirakawa. 4 to 289 to 121 to 352 to Oze. Use Tohoku Shinkansen to Koriyama Station. Change to JR Banetsu-nishi Line to Nishiwakamatsu Station. Change Aizu Line to Aizukogen Ozeguchi Station.